DEE JAY mix club promotes! December 25 is the date of Kristelle’ performance with a number of foreign songs in the Local History Museum. There was a concert devoted to all donors. December 21 is the date of the Car Factory’s presentation — show of the new car models. 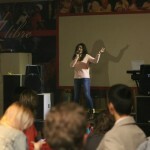 Kristelle was as a guest singer and performed foreign music hits there.